Thanks to decades of consistent efforts to fight desertification and reduce poverty, a story of greening the desert and bringing economic benefits to people has been written in the Inner Mongolia Autonomous Region of China. From a vast barren desert to a land of green plants, Kubuqi desert is a masterpiece of China’s ecological construction and offers a solution for global desertification control. Desertification is known as the “cancer of the earth”. Kubuqi desert, located in the north of Ordos Plateau’s ridge, is China’s 7th largest desert. It used to be the home of frequent sandstorms where no green plant could survive. In recent years, under the leadership of the Communist Party of China (CPC) and the government, as well as the joint efforts of local people and enterprises, Kubuqi desert has experienced a historical change in beating desertification through afforestation. The desert was designated as an ecological economy demonstration zone by the United Nations Environment Program (UNEP). The Kubuqi model of desertification control has also been introduced to ecologically vulnerable regions in west China. With the construction of the Belt and Road, it will bring hope to more desertified regions and introduce China’s experience in fighting desertification to the world. 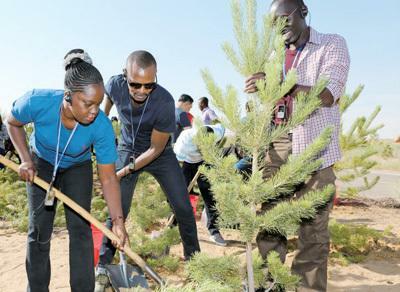 The success of Kubuqi shall be attributed to the unique concept to increase income for local residents through afforestation. Over the past several decades, about 6,000 square kilometers of sand has been tamed, creating ecological benefits worth more than 500 billion yuan, providing jobs for one million people and lifting over 100,000 people out of poverty. The Kubuqi model is a vivid display of the concept that “lucid waters and lush mountains are invaluable assets”. Since the 18th National Congress of the CPC, the Chinese society has firmly implemented the Beautiful China initiative and made more remarkable achievements under the Xi Jinping Thought on Ecological Civilization. The area of afforested land by Elion, a private ecology and investment enterprise in Inner Mongolia, equals the total area of desertification control over the last 20 years. More than 290 of the company’s 343 scientific and technological innovations on curbing desertification were made in recent years. A number of major ecological industry projects were also launched in recent years. Practice has proved that by activating all sides and pooling support from the society, China can make greater strides in ecological civilization construction. The success of Kubuqi shall be attributed to the new mode it created. How to restore and manage ecological system in desert regions is a worldwide tough issue. The report to the 19th National Congress of the CPC pointed out that China will establish an environmental governance system in which government takes the lead, enterprises assume main responsibility, and social organizations and the public also participate. The desertification control of Kubiqi is guided by government policies, invested by enterprises, participated by local farmers and herdsmen, and promoted by continuous scientific innovation. This unique model has brought ecological, economic and social benefits to farmers and herdsmen, making them the biggest participants, the strongest supporters and the largest beneficiaries of the desertification control. It is a model with Chinese characteristics that attaches same importance to both ecological and economic development. The success of Kubuqi shall be attributed to the energy it created. The way people in desert regions choose to develop their economy determines the sustainability of the sand control. People believe that the economic benefit created by the afforestation in the area is comparable to the ecological results. The market-oriented method is vital to the success of the region’s desertification control. Without market, the enthusiasm of the enterprises could not be fully motivated; without industry, sand control could not be sustained. It is the market that has solved the issues such as source of capital, profitability and sustainable development and made desertification control a success. Led by enterprises such as Elion, over 80 companies are now involved in desertification control and sand-related industries. They have largely promoted the development of desert industry, enhanced technological innovation to curb desertification and injected strong impetus into the prevention and control of desertification. Ecology and civilization are closely related, and building an ecological civilization is of fundamental importance to the sustainable development of the Chinese nation, Xi said at a national conference on environmental protection held this May. Efforts to pursue socialist ecological civilization should be made generation by generation. Only in that way can we create a better environment for the people and make new contribution to global ecological security.